WheelTurnerHawaii.com: HWOS Festival Of Sugar And Love 4 - Write Up. 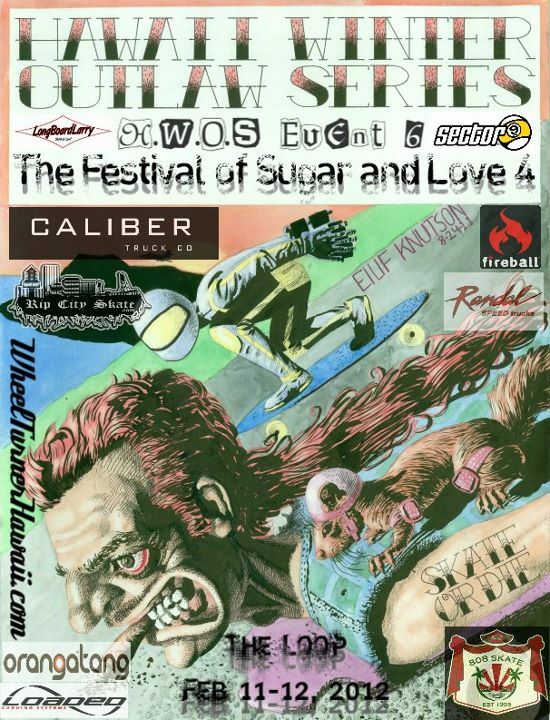 The winter months are coming to an end here in Hawaii, the Hawaii Winter Outlaw Series is getting ready to wrap up… but not with out finishing it off with FOSAL4. On Feb 11 and 12 skaters from all over Hawaii camped out in a park that is like heaven to a dh skater, and sessioned everything it had to offer. A perfect ending to a great race season! The 25+ skaters were on the hill early Saturday morning, setting up camp for the night. Excitement was in the air as people talked about last year’s event, and what was going to go down during this one. Once camp was set, we decided to get on hitting the hill under the beautiful weather we were blessed with. To get the weekend of skating kicked off we went straight into an hour long warm up freeride sesh. This year’s pool of skaters had A LOT more grom’s then the past, and they were proving to everyone they knew how to throw down. Once riders were awake and warmed up… we moved to the S Turn for the first round. The rules were decided on, skaters got geared up… everyone was ready to start. And BOOM, guess who shows up! A very frightened DLNR Officer screaming about how he saw us almost get hit by a car coming uphill… ON A ONEWAY DOWNHILL ROAD, sureeee. He ended up shutting us down. No problem for us! We are gonna be here all day and night. We wanted to give the screaming officer a chance to leave, so we went back to the campsite for a tasty BBQ. After the food settled, skaters started rolling down one of the gnarly rock/dirt paths near the campsite. People were starting to get gnar, so we decided on a little OFF ROAD CHALLENGE for a deck and some schwag. Everyone threw themselves into the ground several times and making it the furthest in the mud challenge was Josh M.
Rider’s took a breather and we all headed back to the S Turn to finally get started on the real skating. First round was set to be a 45 min Jam style session. Everyone at once, with secret judges. Once the timer started, the turn got littered with STEEZE. Within the first couple runs we already saw more go down then though out all the past years combined. Hands down, stand ups, going fast… every entered skater had it all. And it wasn’t only the FOSAL vet’s throwing down, everyone’s skating was impressive. As the jam sesh moved along skaters were going faster and faster. Every trick in the book was being thrown down, along with some new ones. Unfortunately shredder Tyler W even snapped his wrist in a gnar pack run! When the 45 minutes were up skaters were given a chance to take one last run, and the judging began. It was back to the camp site for the results from round 1, and now we have our top 12 skaters. The skaters who made it had a big mix of styles so round 2 should be good! Everyone got a little safe and warmed up, then we got underway with round 2 on rocky left/right. 30 min Jam Style. This side of the park is totally different then the S. Rather then scrunched up turns on top of each other, this side is fast and spread out… so skaters were approaching it a little different. In the top everyone would keep their lines fast and throw big slides. Once approaching the bottom parking lot, the bag o trick would open up for most. The skaters in this round were pushing each other to go bigger and faster throughout the whole 30 minutes. The sun is setting, the jam sesh is wrapping up, and last runs are go down. Round 2 is complete and a little sunset freeride sesh gets underway as the judges decide who will move onto the next round. After long debate, the judges had decided on the top 6 skaters to move onto the next day. KJ, Roland, Mackenzie, Evan, Toa, and FOSAL 2 winner Pono A. 5 Oahu skaters and 1 from Maui… for the past 3 years its been all Maui winners! Tomorrow’s final rounds are going to get gnarr. Skating is done for the day and everyone gathers at the camp site for the night. Awesome food was grilled up, people got crunk, everyone got interviewed by Cookie, fires got made ( and jumped ), followed by a couple Heights runs…. Then the exhausted skaters finally passed out. People at the campsite started to rise with the sun on Sunday morning. Got breakfast and coffee going. Some even went for a little dawn skate. As more started to wake up and get ready… the clouds started to roll in. What’s a FOSAL without rain? Tents were broken down and everyone gathered to decided what would happen from here. The call after some discussion amongst the top 6 skaters was to watch “crab salad” boost the kicker into the mud for a bit… then get under way with the final rounds in the wet. Making the call on the mud kicker was prime. Brandon busted out a mountain board ankle breaker thing and started to get gnar on some of the muddy trails. It was AWESOME and I wasn’t even skating. A few dared to try the board… but it was way more fun watching him get muddy. Mud sessions wrapped up and everyone headed back over to the drenched S turn to get underway with the competition. Same turn as yesterday, but a whole new game with the rain. Some got barefoot, others switched up boards… but all were definitely a little nervous. This round is also being run a little different from the last two. Instead of a relaxed jam sesh. Each rider got 5 runs total to nail everything they wanted to showcase. All skaters style changed a bit with it being so slick, hands were dropped a lot more… well not Evan’s due to his casted up arm. Spiny tricky standies, then onto spinney hands down. I almost want to say it turned to tech over speed. And if a rider could make it though with speed, it was bonus points for sure! When the 5 runs were done, our judges ( including all time shredder Darryl Freeman) came up with who they think should move onto the semi finals. Now the 4 skaters that would be slip n sliding through the wetness were KJ, Toa, Mackenzie and Pono A… still holding it down for Maui ! SEMI FINALS. Now the final 4 skaters get 4 runs to give it their all… the top two from here go on to the FOSAL4 finals. With the limited amount of runs it was an interesting call for riders. Be risky, go for tricks and possibly fall… or just keep it safe. Safe wasn’t the way for any of these Hawaiians, but being risky wasn’t a bad thing. There were some spills… but even more impressive runs. And after all the runs are up, the judges make the call for KJ Nakanelua and Mackenzie Yoshida for the finals, who are also out 1st and 2nd ranked racers in the over all series! The finals are 3 solo runs, and 2 tandem runs ( lead one, follow one). KJ’s solo runs were almost all standup. 360’s n no comply’s in the top then steeze in the turns. Mackenzie’s approach was a couple tricks in the start with speed, spins and hands down in the turn. Both riding styles very different. But both on point. Now for the tandem runs. KJ leads the first. Both start with standup tricks and end up dropping hands in the turns staying very close. Mackenzie leads the second. Mack takes off using hands down, doing a speedy spin/ Coleman cliffhanger while KJ stays standup. At this point the judges and crowd are cheering for the riders to keep skating to break the tie they said they have. But the skaters were too beat to keep going, and now it was decision time. Not only is the FOSAL title on the line, but after the finals we will have the final points ranking finished! After giving the judges some time to make their call, we got the TONS of schwag together and started with the awards. Coming in tied for 5th and 6th for the festival was Roland Bargiel and Evan Twigg Smith. In 4th was young shredder Toa Nanpei from Mililani. In 3rd was former winner Pono Ashlock. Coming in 2nd was Mackenzie Yoshida and in 1st taking it home for OAHU for the first time was KJ Nakanelua. Following the Festival results we tallied up the overall series points for the 2011-2012 season. Skaters were given points depending on how they placed in each of the races, and they are added up to get our overall champ. The skaters who went their hardest all season and made the top spots were 6th Rhys Morishima, 5th Maika McWayne, 4th Jeffery Khau 3rd Keola Chu 2nd KJ Nakanelua and 1st for the second year in a row Mackenzie Yoshida. Big Mahalo to all of the skaters who came out to help finish off our season successful! Also a big thanks to the sponsors who supported our scene. Without the skaters and support, our scene wouldn’t be where it is today. Next year will be only bigger and better. Check back for the event/ series video along with the full season write up.